1930s original Hawaiian home on the hillside of the bay. shopping,restaurants, museums, theaters and more! Nearby black sands beach for fantastic snorkeling and swimming. Spectacular Water falls close by. This lovely home is located in a quiet neighborhood. A Cozy living area with internet....Open the windows and feel the bay breeze. Two twins, pushed together to form a king. All new bedding in both rooms. Dining area, seating up to six. Full kitchen complete with everything you'll need to make dining in easy. This vintage home has been redecorated for comfort and a tropical retreat. Enjoy complimentary fruit and breakfast items including coffee and tea. Soaps, shampoo, conditioner, moisturizer and so much more. Beach towels and matts also provided. Come and live Hawaii ! I love the Big Island. Come and explore! Close and convenient to all. Adorable, comfortable, with a few of the quirks of the days gone by. Walking distance to the farmers market, and the downtown area. Good exercise. Perfect Hilo location to walk downtown, well outfitted kitchen. Two bedrooms included room for potentially a medium-large family. Kitchen was stocked with everything you need further prepare meals and save some money on your vacation. 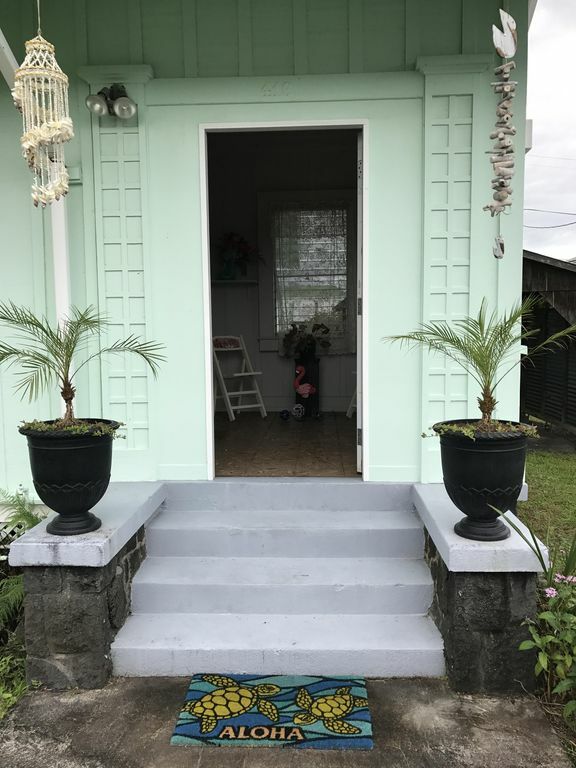 The house is situated on Haili st overlooking downtown Hilo and is within a short walk from many of the best restaurants and bars, and also the Sak'n'save grocery store. The beds were nothing to write home about but there were clean linens and many extra blankets in case anyone runs cold. The were also a lot of clean towels plus a washer and dryer. Michael, the owner, was also very helpful. A windstorm knocked part of the gutter off and he came out to fix it the next day as soon as I mentioned it. This house is simple, classic , vintage original Hawaiian Style house with all of the amenities. It reminded me of my families house I grew up in on Maui. It’s in the heart of downtown Hilo and close to all sorts of activites, places to visit and eateries. The owner was very communicative and welcoming. He even left us some goodies! Don’t stay here if you’re expecting a NEWER, Fancy rental. This is an older cottage style house. It has character! I will definitely be staying here again in the future! Jennifer’s description is perfect ! Great house for exploring Hilo. Great house for exploring Hilo. The house is very well maintained, clean and nicely stocked. We had a nice visit. We had a wonderful time and enjoyed the accommodations!